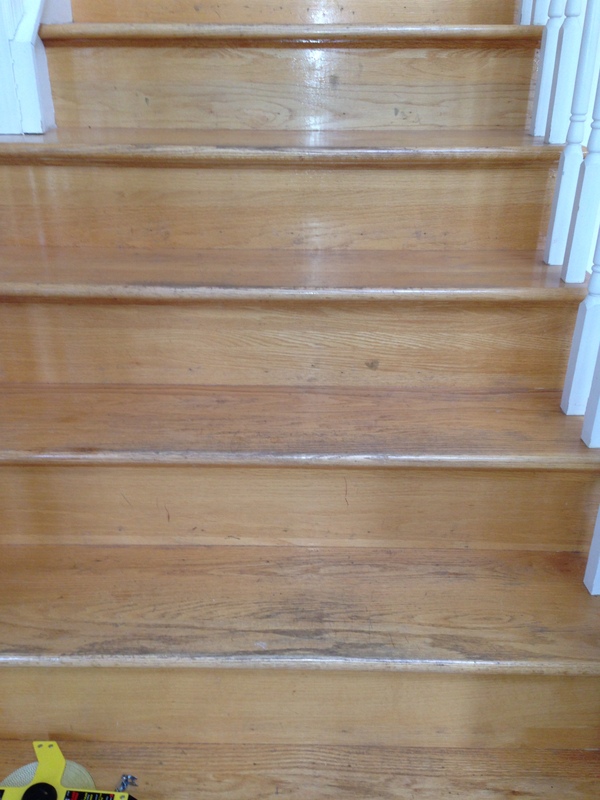 You may remember the condition of the stairs from Ashley’s previous post. 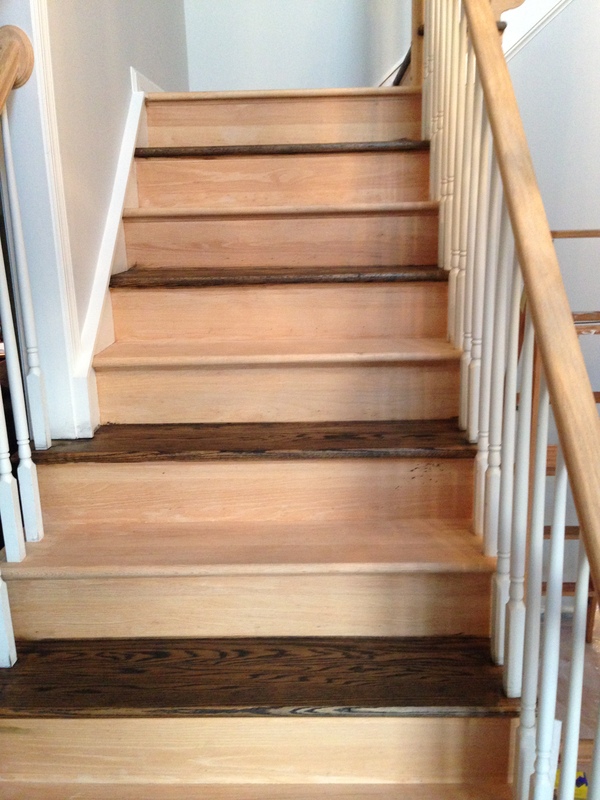 Because they were in such poor condition aesthetically, we couldn’t take any short-cuts and had to refinish them the old-fashioned way; strip, sand, stain, poly and paint. Like I mentioned, with our active family, it took us about three months from start to finish. Luckily, we did this during the fall and were able to keep windows and doors open when necessary. Prep: We prepped the area with plastic drop cloths, painter’s tape and newspaper taped to the areas we didn’t want to damage. One word of caution: We found that the stripper got underneath our cheap painter’s tape. I’m not sure better tape would protect the spindles or not, but we discovered that the tape was basically worthless. 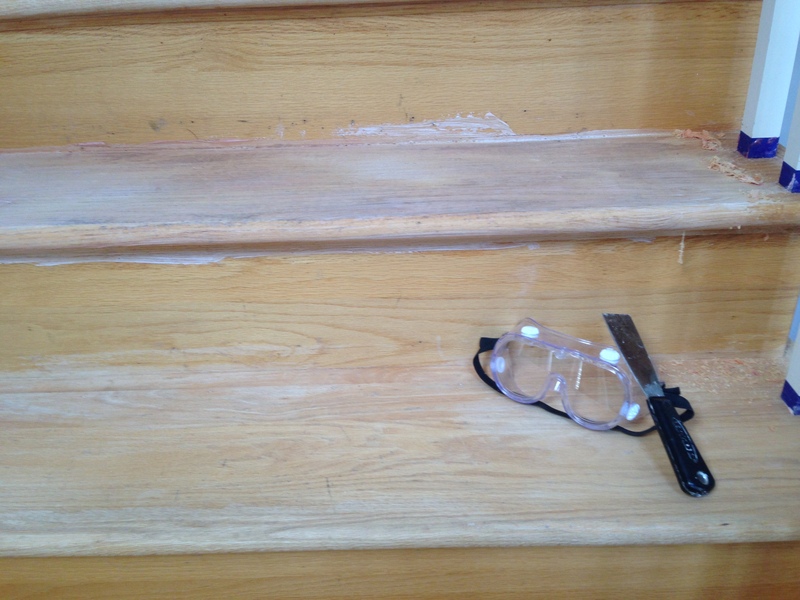 Apply Stripper: We used the cheap brushes to paint on the stripper skipping every other step so we could still have limited use of the stairs. I decided to keep the spindles white so this is the only time I used painter’s tape to keep the paint from getting stripped, though as I mentioned, it didn’t help much. Remove Stripper: After the allotted time, we wiped off excess stripper with disposable rags, then used the metal scraper and/or 5-in-one tool to scrape off any remaining stripper and old finish. Wire brushes were the best at getting in cracks, crevices, corners and curved areas (especially on the railing). USE EYE PROTECTION and old clothes as this flings stripper and chemical gunk everywhere. Sand: Sand, sand and sand some more using the orbital power sander on the treads and hand sanding everything else. This is tedious and the orbital can really do some damage, so be careful and take it slow. Also, use progressively higher grit ratings up to about 300. If you stop with 220, swirl marks will show up once stain is applied. One word of caution though, if you make the steps too smooth, you may end up making them incredibly slick and dangerous to navigate with socks on. Final Prep: Wipe down with mineral spirits making sure you remove every bit of dust. The mineral spirits will both remove the last bits of stripper and also help remove the dust. Dust is your enemy when you stain! 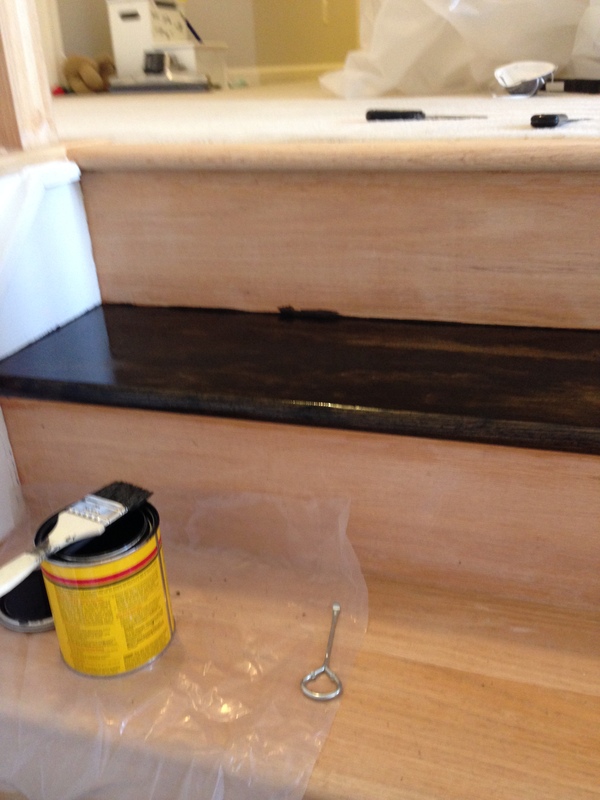 Staining: Again, we stained every other step, following the instructions on the stain. It is very important to stir the stain well before applying. We thought we could get away with vigorous shaking, but discovered that stirring is absolutely required. Had we stirred from the beginning, it would have taken significantly less time and effort. 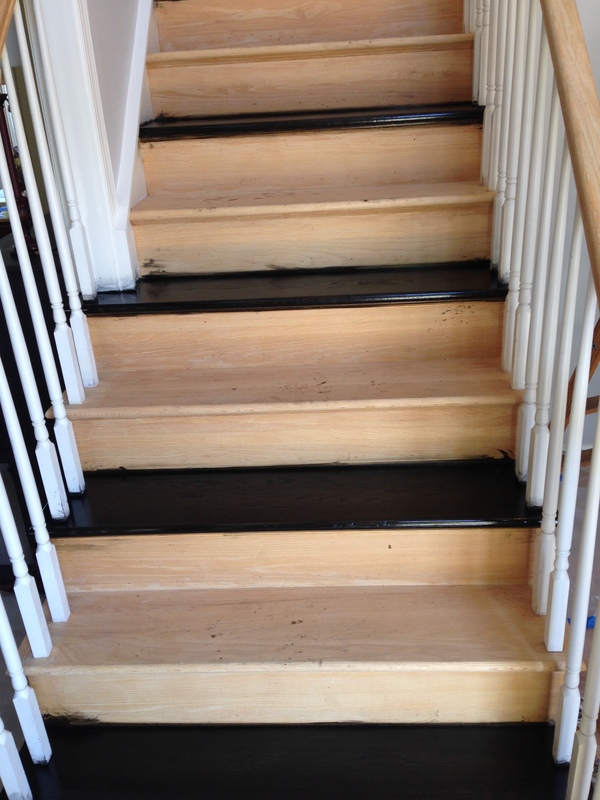 Stain (again): Save the rail staining for last, after the steps are completely dry. Going up and down the stairs, walking up and down every other step is hard enough. Add to that the fact that you can’t grab the railing and you are setting yourself up for a trip to the ER. 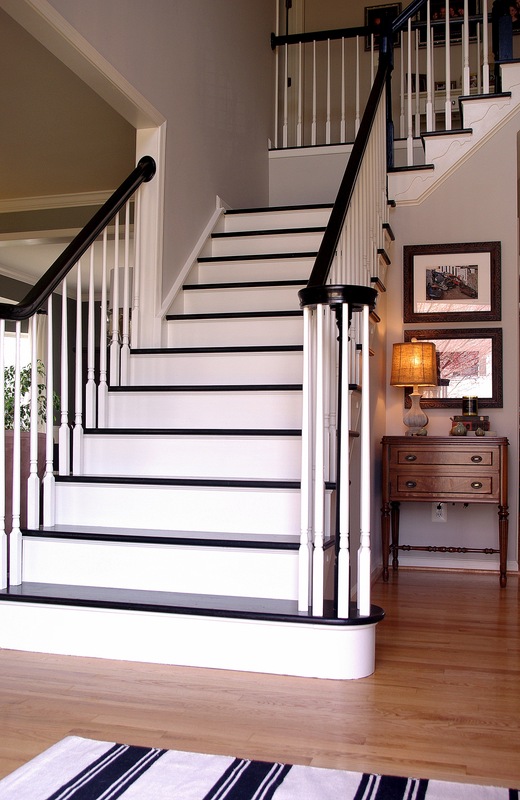 Polyurethane: After you reach the desired stain color, apply the poly. It is very thin and will run and splatter like crazy so have a rag in your non-painting hand to immediately wipe up streaks, sprays and sprinkles. After letting it dry, we lightly buffed the poly with steel wool before applying another coat. This is tricky business. Fail to buff enough and the poly will peel. Buff too hard and you can go through the poly and also through the stain. This is OK if you are going for that distressed look, but not so great if you are trying to avoid starting the entire project over. We applied 3 coats of poly, but after a few months I think one or two more might have been a better option. It goes on very thin and I don’t know how only three coats will hold-up after a couple years of kids and pets running up and down. Paint: Last step is painting the risers. We used Behr’s semi-gloss in Swiss Coffee, the perfect trim color in our opinion. Due to the stripper damage and the fact that I didn’t tape the spindles during the staining process, I also gave them at least three coats of the same paint. 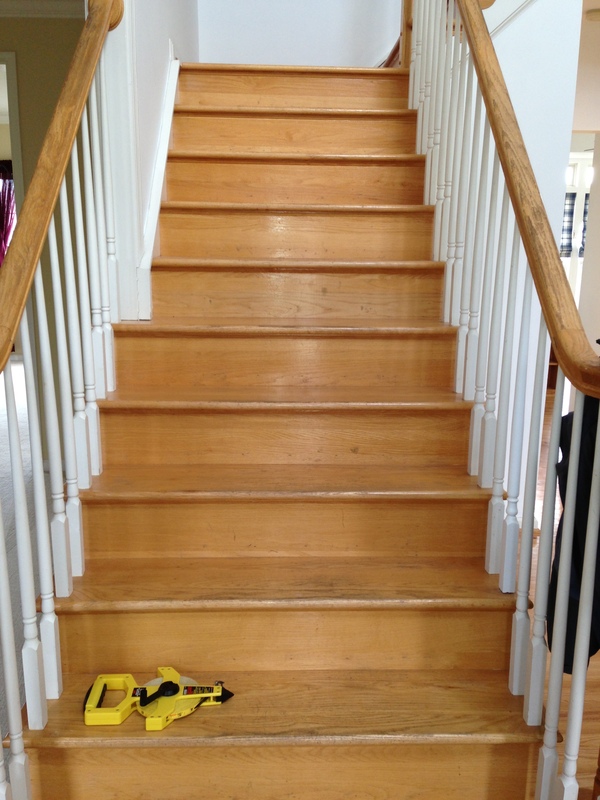 Again, here is our finished staircase! Like Ashley mentioned, it really was like childbirth. As we were executing this project, I swore I would never do another like it. Now that we’re a few months postpartum, I’m ready to take on the kitchen! The whole thing MUST GO! Honey, where’s the sledge hammer? Sheli, you are hilarious, and I felt your pain with every step….literally! Haha, Missy! If you really want to get in on the pain, I mean action, I’ll give you a call when we start on the kitchen! Sheli, I was amazed by Ashley’s pictures, but I am totally in awe of your courage!! The result is gorgeous. 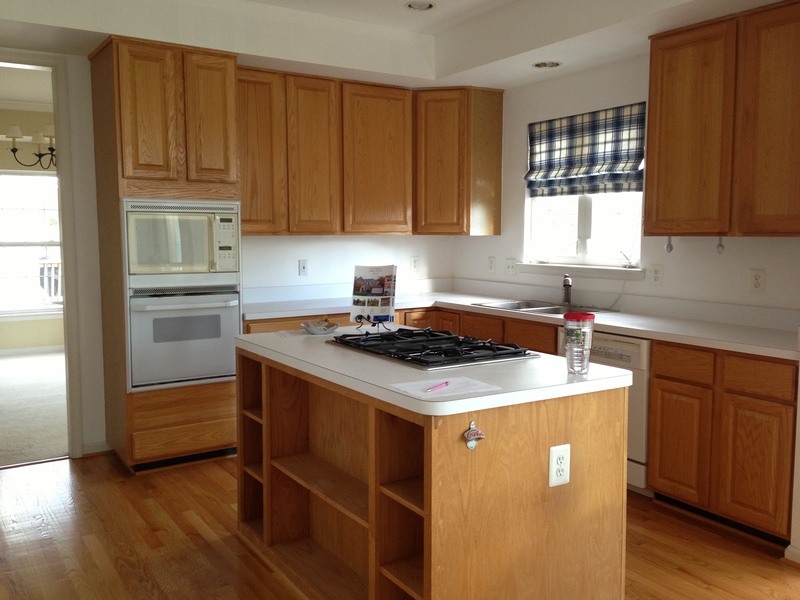 I can’t wait to follow your kitchen remodel. Aw, thanks! Though I’m not sure if it was courage or ignorance. We’ll definitely be more prepared when we take on the kitchen. We learned a lot! Previous PostFoyer Transformation. You won’t believe this one!